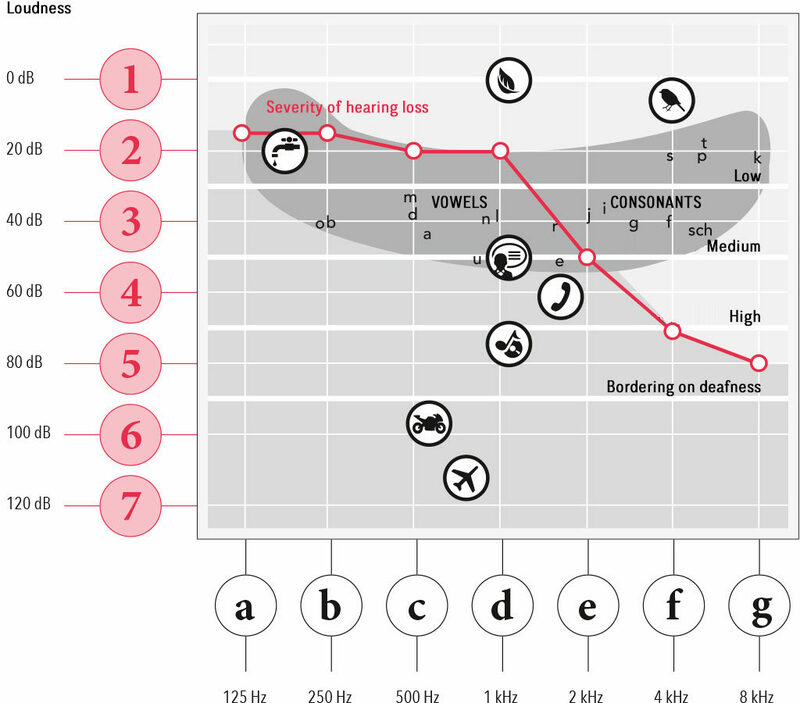 HANSATON End Users - How do you measure hearing loss? The “speech banana” aids the analysis process. Not all hearing loss is alike. There are many gradations between “good hearing” and “almost no hearing at all”. That’s why professionals distinguish among mild, moderate, severe, and profound hearing loss when analyzing hearing. Our speech is made up of tones and sounds at different volumes and in different frequency ranges. The “speech banana” is a visual representation of these sounds as consonants, vowels, and sibilants on an audiogram. People with normal hearing can hear and understand the entire spectrum of speech. For people with hearing impairment, it’s a different story: depending on how severe their hearing loss is, they may no longer be able to hear high tones (such as birdsong or rustling leaves), or they may even have a hard time following telephone calls or conversations. Professionals use these audiometric measurements to calculate a person’s individual hearing loss and select a suitable hearing system. Age-related hearing loss can begin developing as early as age 25. We begin to lose our ability to distinguish “S”, “F”, “D”, and “T” sounds from that age. Click here to find out how to identify hearing loss.